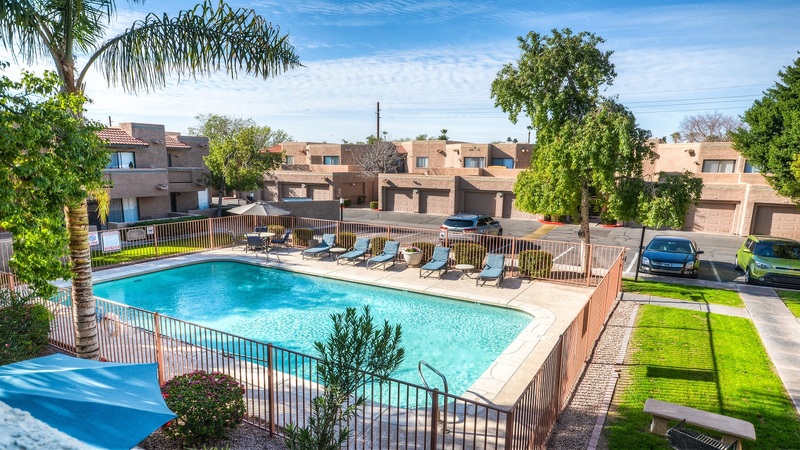 Phoenix, AZ – September 11, 2018 – ABI Multifamily, the Western US’s leading multifamily brokerage and advisory services firm, is pleased to announce the $11,600,000 / $146,835 Per Unit bulk condominium sale of Scottsdale Haciendas, located in Scottsdale, Arizona. Built in 1985, Scottsdale Haciendas is a two story, garden-style condominium community that features 79 units of 180, in seventeen rental buildings constructed of wood frame and stucco. The property has flat and pitched shingle roofs and rests on approximately 7.98-acres. The unit mix consists of (45) two bed/ two bath units and (34) two bed/ two and a half bath units with an average size of 1,003 SF. Interior amenities include granite countertops, all electric kitchen appliances, washer and dryer in-unit, skylights, hardwood/tile/carpeted flooring, extra storage, vaulted ceilings and a balcony. This condominium community also provides its residents with two swimming pools, private garages, barbecue area, and pet waste stations. The location of the property rests just minutes away from the luxurious Scottsdale Fashion Square, Camelback Mountain, and Phoenix Zoo. The buyer is an Arizona-based private investor. The seller is Canada-based, Western Wealth Capital. With over 20 years of experience, the Western Wealth Capital team has completed over 85 projects and helped individuals invest over $1,500,000,000 in real estate. By providing top quality investment properties in high growth markets, WWC has become an industry leader in Western North America. The multifamily brokerage team of Eddie Chang, Doug Lazovick, Nathan Bruer, John Kobierowski, Alon Shnitzer and Rue Bax represented both the Buyer and Seller in this transaction.